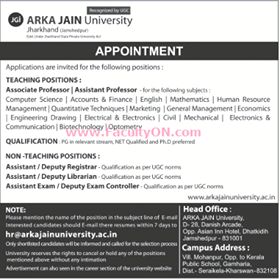 Arka Jain University, Jamshedpur has advertised in Times of India newspaper for the recruitment of Associate Professor/Assistant Professor jobs vacancies. Interested and eligible job aspirants are requested to apply within 7 days. Check out further more details below. About College: In Feb’2017, ARKA JAIN University was established by the JHARKHAND State Legislature under “The ARKA JAIN University Act”. The University is a government-recognized university with the right to confer degrees as per the Sections 2(f) and 22(1) of the UGC Act, 1956.The sprawling campus of the University is situated at Gamharia,Dist: Seraikela – Kharsawan, 13 km from steel city Jamshedpur. The University offers multi-disciplinary programs, all of which are designed to be industry-relevant.